Gymnasts combine explosive power, strength and grace to perform routines on each piece of equipment, as well as on the floor. In addition to tumbling and apparatus skills, the gymnast must incorporate dance and flexibility moves into each routine. 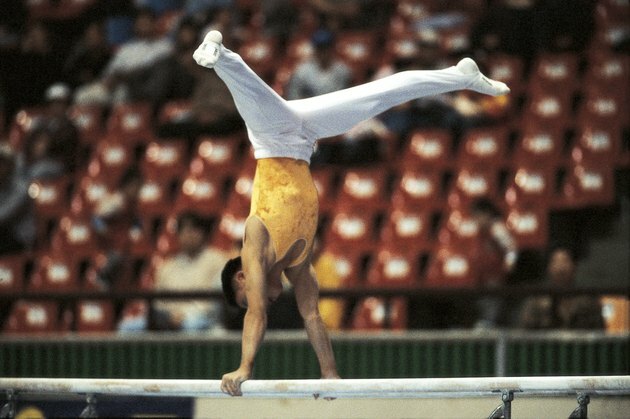 Throughout the entire routine, the gymnast also displays a superior sense of balance, including both static and dynamic balancing techniques. Many young gymnasts start by learning to balance on one knee, which prepares athletes for more advanced moves later in their training. During a knee scale, the gymnast rests with one knee touching the floor. The other leg is extended out behind the body, with the arms straight out in front or to the sides. In variations of the knee scale, gymnasts extend the leg in front of the body or out to the side. In a standing balance, the gymnast balances on one or both feet while maintaining a pose. This type of balance may include simply extending one leg out in front of the body or out to the side. The scale represents one of the most popular standing balances, in which the gymnast extends one leg straight behind the body in an arabesque position. The arms may extend out in front of or to the side of the body, or the athlete may keep the arms in motion to add artistic merit to the routine. In a variation of this move, the Y-scale, the gymnast extends one leg out to the side of the body so that the foot remains at shoulder or head level. In more advanced versions of the scale, the gymnast keeps the free leg straight while holding the foot or leg in front, behind or out to the side. This balance may also include standing splits in which the head either stays upright, or the upper body rests against the standing leg. In an attitude variation, the gymnast keeps the standing leg straight but bends the free leg in front of or behind the body. All standing balances may be performed with the standing foot flat on the ground or with the gymnast raised up on the toes. An arm balance consists of the athlete balancing on one or both hands or forearms. The most common move is the handstand, which requires the gymnast to balance the entire body on two hands. Athletes perform many different variations of this balance, including one-handed versions and variations of the leg position. Many of the moves performed on the beam, rings and pommel horse also incorporate different types of arm balances. Some partner routines require a pair of gymnasts to balance one another using the hands, feet and other body parts. In the basic knee balance, one partner remains on the floor, resting on hands and knees. The other partner stands on the base partner's hips, and may or may not hold the base partner's shoulders for balance. In a foot bird balance, the base partner lies on his back and balances the other partner using only his feet. Countless variations exist to allow gymnasts to demonstrate partner balances, including versions where one partner supports the other overhead using only his hands.